Simply put, a lean-to barn is a barn with lean-tos added on the front or on one or both sides. Typically, a lean-to barn will include some open-air roofed space, which is a nice way to shield your animals from the wind or weather without having to bring them inside. If you need an open-air roofed structure with open accessibility, we can do that for you at Metal Garage Central. If you’d like to have your lean-to barn enclosed or partially-enclosed for more protection and security, we can do that too! 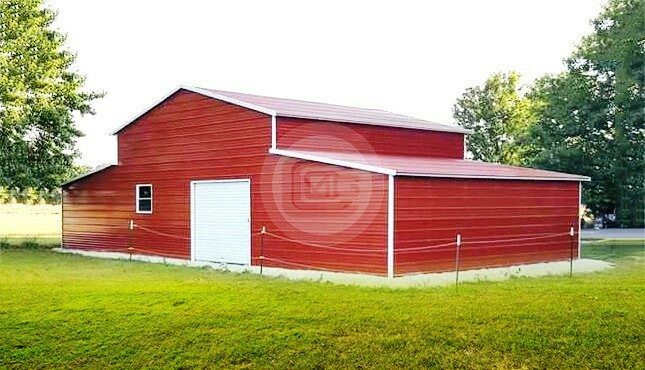 Lean-to metal barns are a flexible, rugged and durable solution for farming and agricultural applications. Unlike conventional wood barns, our lean-to metal barns aren’t susceptible to rot, mold, mildew, or termites. As a farmer or rancher, you need high-quality outdoor structures for multipurpose uses. 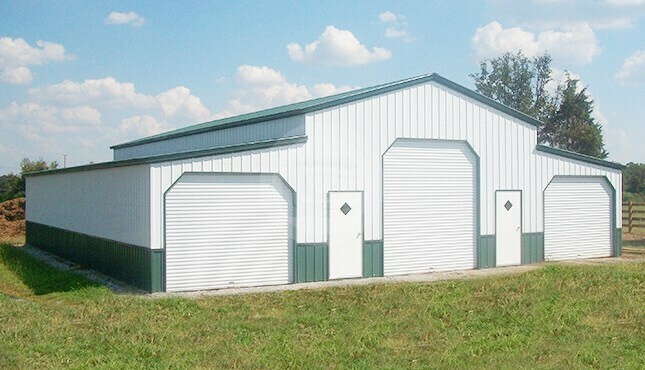 A steel barn requires much less time and energy for maintenance, and can also withstand heavier wind and snow loads than traditional pole barns. 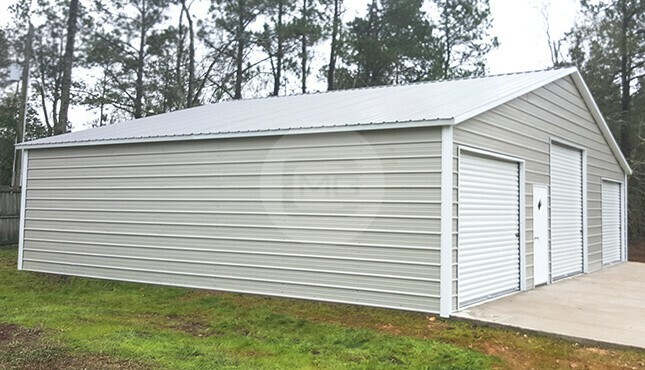 Steel barns can be installed on any level surface, including concrete, gravel, or dry ground. 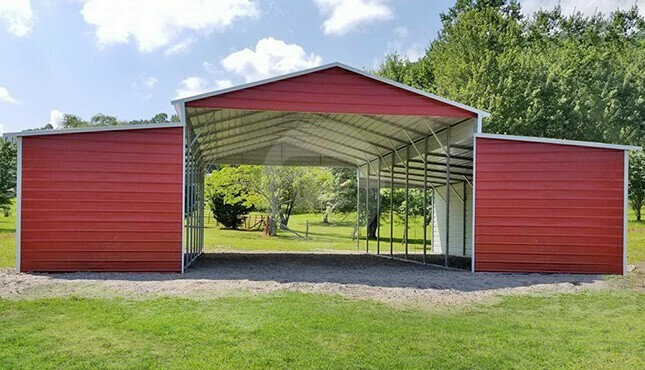 What colors to choose for your lean-to metal barn? 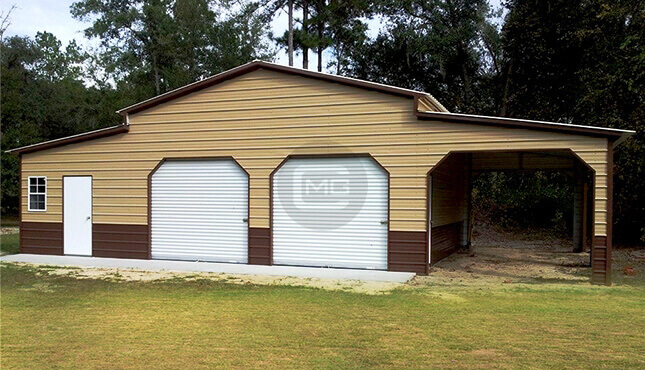 With Metal Garage Central that’s entirely up to you, including the ability to choose from attractive two-tone options. Depending on the manufacturer that we use to service your local area, there are currently up to 18 different color selections available. If one of your goals is to help your barn blend in with your home or other surrounding structures, we almost certainly have color choices that will make that possible! Why Choose Our Lean-To Barns? Gone are the days of having to settle for an old, red wood barn that won’t stand the tests of time and the elements. 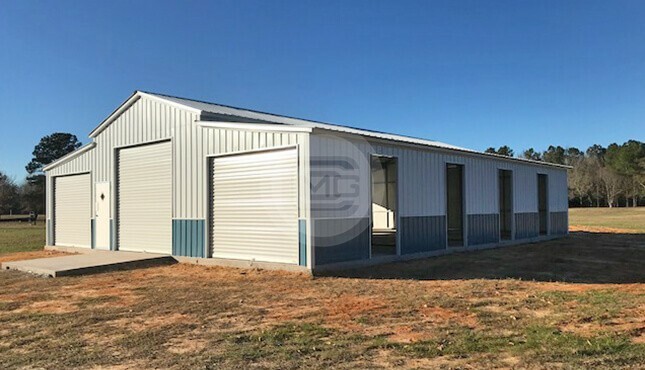 With modern engineering technology and the use of American steel components, Metal Garage Central can provide you with a much better solution for your livestock and storage needs. The design options for our lean-to farm buildings are almost limitless! 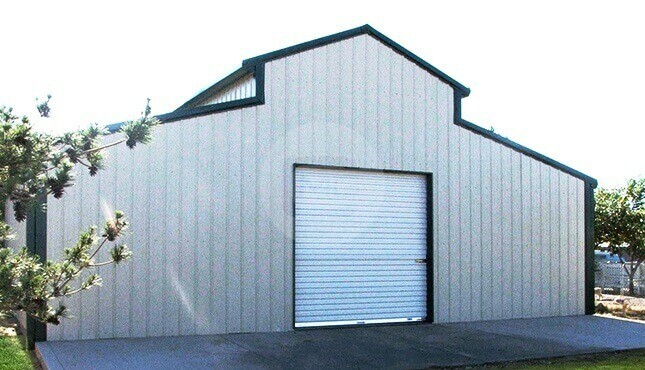 We can custom-build many varieties of lean-to combination buildings to suit your needs. We can work with you to design and install a barn with lean-to extensions on either or both sides. 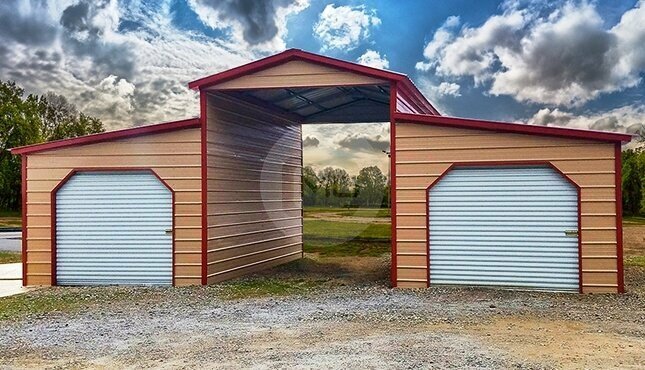 The center portions of these custom barns can be enclosed with the lean-tos left open, or conversely we can enclose the lean-tos and leave the center building open. 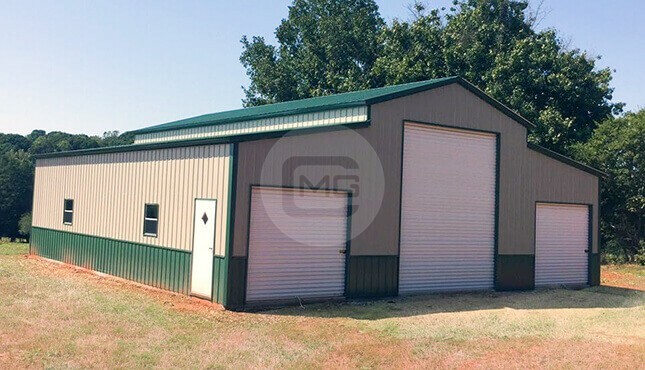 Our lean-to metal buildings are incredibly flexible and functional in their design, and are completely customizable. Our friendly, knowledgeable building specialists are here to help! We’re happy to walk you through the whole process, from design to ordering to production to installation. 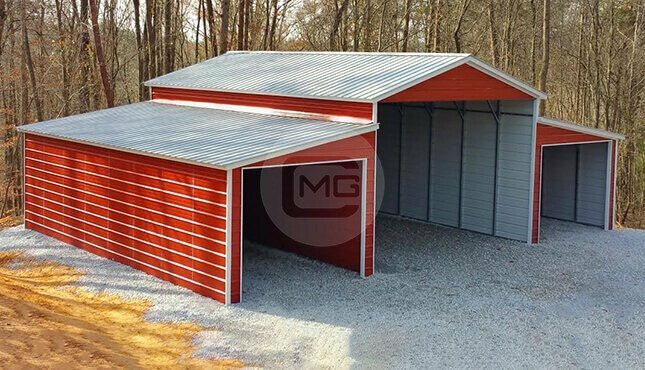 Check us out online at Metal Garage Central, or give us a call at (980) 321-9898 and let’s get started on designing the lean-to barn of your dreams today!.